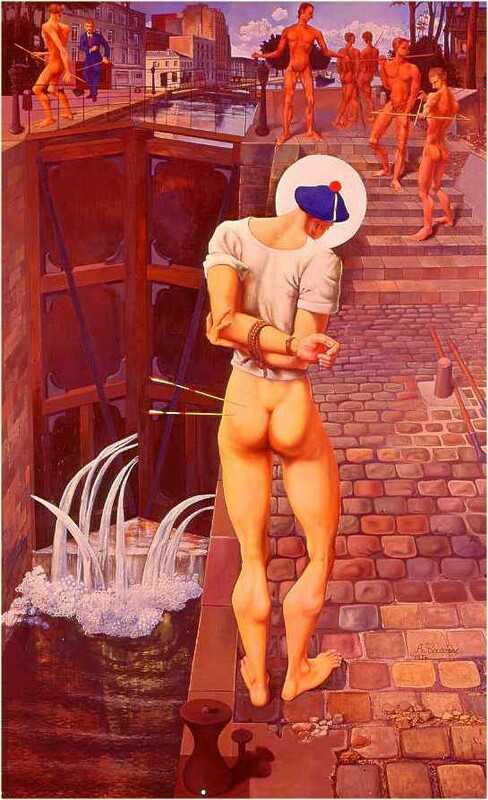 The "San Sebastien at the Saint-Martin waterlook" of 1974 keeps travelling : it goes to Mexico, at the MUNAL museum, as a continuation of the “Masculin-Masculin” exhibition. “I have painted the subjects that I wished to paint at given moments. If I have one day an idea for a painting, I keep it in a corner of my mind, then extract it again. I think about it during the night, as my dreams pass by, in the street where you see things or people, and when the idea has taken shape, I start to work. The theme which has little by little become evident in my mind makes me happy. It mixes up the Judeo-Christian civilisation, the Greek one from where we all depend, to realities of day to day life. From these confrontations emerge a general view that forces me to translate it into a painting that “says” something." 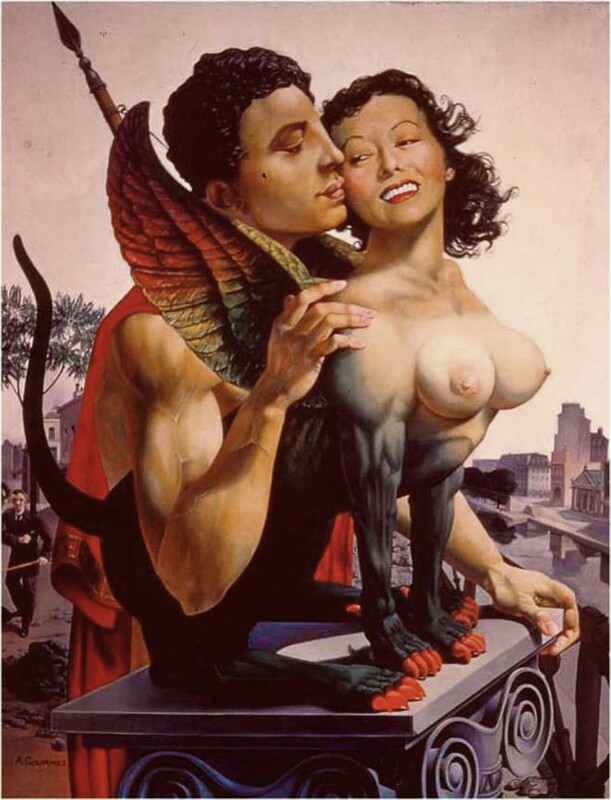 "Oedipus and the Sphinx represent the eternal exchange between man and woman." The two heroes come from an advertising of the “Colgate” toothpaste. The Sphinx smiles, showing his teeth to illustrate the popular logo “white teeth and fresh breath”. 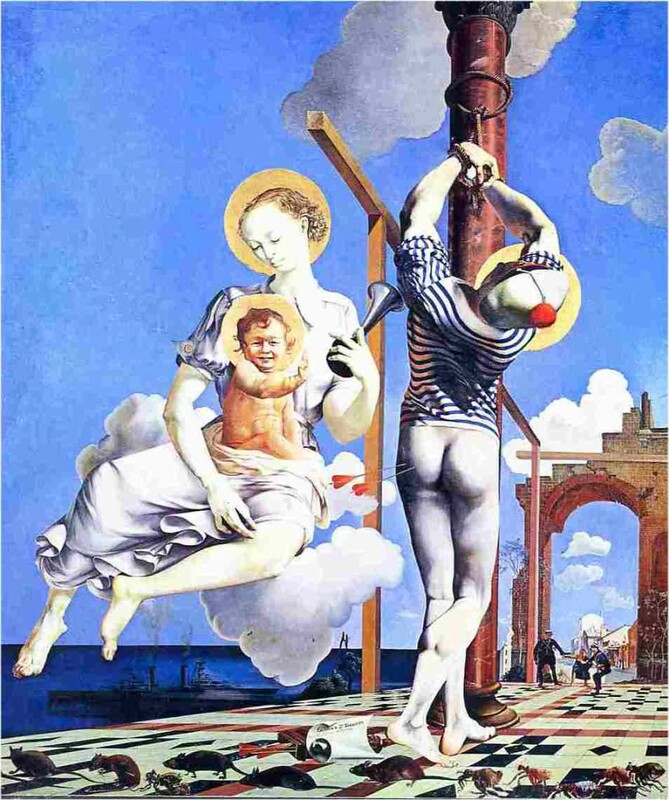 “The person with a stick behind Oedipus I placed to evocate morals, traditionalists’ morals. To create the atmosphere, you have to respect, at least partially, historical painting; I have added on my nice Saint Martin canal a small Greek temple. But whatever your efforts, you won’t find it as it does not exist in reality”. 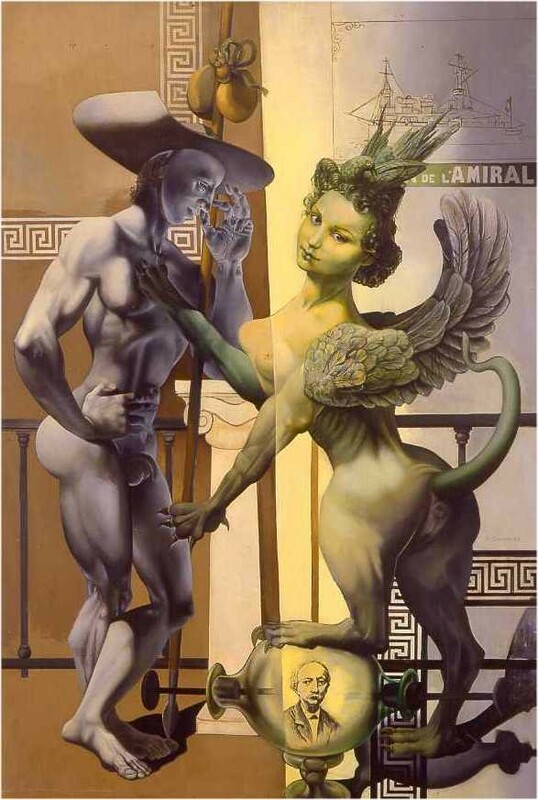 “…the prominent muscles of Oedipus and the impressive breast of the Sphinx with wings by Courmes, their expressions, show quite clearly that metaphysics is excluded from this flirt, happening on a forefront overlooking the Saint Martin canal,” Jean-Marc Campagne, Alfred Courmes, Eric Losfeld, Editor, 1972. “How was the contact between the two? - Sort of swing with a seat or a wood plank hung by ropes. - Painter scaffolding made of a seat that can be moved up and down by the painter himself. Oedipus, in Greek mythology, king of Thebes, son of Laïos and Joceste, king and queen of Thebes. Jocaste expects a baby. Her husband Laïos interrogates the future for a prophecy that foresees that this son shall kill him and marry his mother. To escape this destiny, Laïos tightens together the two feet of his son, wounds them with his sword, and orders that he be carried in the mountain and abandoned to wild beasts. The servant in charge, full of emotion for the baby, gives him to shepherds of the king of Corinth. This king, without heirs, takes charge of the baby as if he were his son and names him Oedipus. (in Greek, “the one that has swollen feet”). Years pass by and one day, a Corinthian says to Oedipus that he was an abandoned child. Getting frustrated, Oedipus requires the truth from an oracle in Delphi. On the way there, an old man driving a cart ask him disrespectfully to free the way. Oedipus rather excited kills him. It was of course the king Laïos, his father. Oedipus executed the first part of the prophecy without knowing it. Oedipus arrived in Thebes, town that was scared by a monster blood thirsty, the Sphinx, lion with a woman’s head. This monster blocked all the roads leading to the town, killing and devorating all the travellers who could not answer the famous question of the Sphinx: “What animal walks on four feet in the morning, at midday on two, and when the evening comes, on three?”. 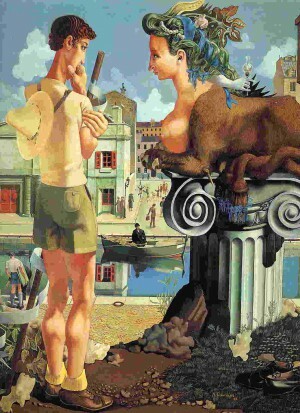 With no hesitation, Oedipus answers that it is a man, who as a little child walks on hands and knees, then as an adult on his two legs, and when he becomes old, uses as third leg a walking stick Taken aback, the Sphinx commits suicide. Oedipus became a star in the city to have freed it from the Sphinx. To thank him, the population made him king and insists he would marry the widow of Laïos, Jocaste. For many years, the two lived happily, ignoring that they were mother and son. The second part of the prophecy was accomplished. Years pass by, the incestuous couple has children, two boys (Eteocle and Polynice) and two girls, Antigona and Ismene. Gods that have favoured for long the reign of Oedipus discover suddenly with bad faith, that this king is a murderer. As a revenge, a plague epidemy ruins the country and his inhabitants. Oedipus, innocently, requires his uncle Creon to go to Delphi and ask for a prophecy on his behalf. It says that the murder of Laîos must entail a revenge. Oedipus express then against the murderer a vicious threat, and ask the divinatory Tiresias to find the murderer. Tiresias refuses to tell the truth, giving even to Oedipus reasons to believe that he himself could be the wanted person. At the end, getting angry, he advises Oedipus to ask his servants. One of them, having seen the murder, is the very one who in the past times, had “lost” the baby on MountCitheron. The truth is established, Jocaste is desperate and commits suicide. Then Oedipus destroy his eyes and leaves the throne. He goes along the roads with Antigone to look for mercy. Arrived in Atticus, he is purified of his crime by Theseus. “Representing parody and comedy with borrowings from day to day life, two of the sources of plastic art in the 20th century, Alfred Courmes has modestly testified of a cultural bridge between the “symbolists” of his childhood and a new generation of “post-modernists” artists. He transmitted them, with some peculiarities, centuries old myths while preserving all the potential of a great historical painting”. Christian Derouet, extract from the foreword of the catalogue of the Jean Briance Gallery, April-May 1986. 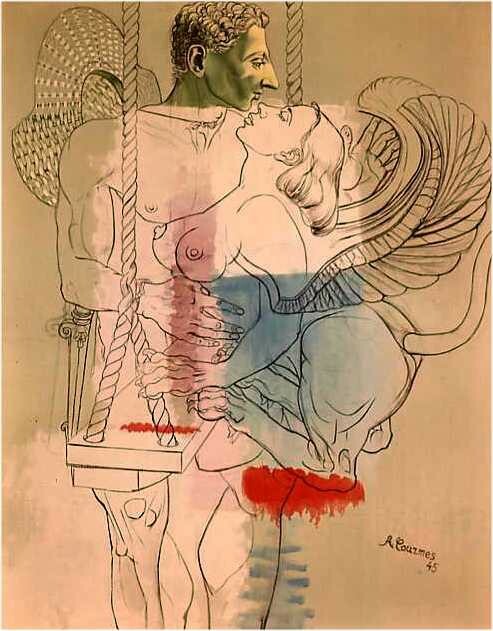 You shall discover in a next issue all the different Oedipus and the Sphinx and the end of the story: Oedipus and his daughter Antigone, version Alfred Courmes. - 1979, Retrospective, painting museum, May16th to August 20th, Grenoble. - Jean-Marc Campagne, Alfred Courmes, Prospecteur de mirages entre ciel et chair, Photographs by Robert Doisneau, Jacqueline Hyde, Marc Vaux, Eric Losfeld publisher, 1973, front page and Page 36. - Vitalie Andriveau – Gilles Bernard, Alfred Courmes, foreword by Michel Onfray, cherche midi editor, 2003, pages 122-123. - 1989, Retrospective, museum of Hospital Saint Roch, from October 21st to December 17th, Issoudun. Cherche midi editor; 2003, page 101. - 2009, “Ingres and the Modern”, museum Ingres, from July 3rd to October 4th; Montauban (exhibition headed by Dimitri Salomon). - Vitalie Andriveau – Gilles Bernard, Alfred Courmes, foreword by Michel Onfray; Cherche midi editor, 2006, page 95. - 1986, private exhibition, Gallery Jean Briance, from April 10th to May 31st (61 paintings) Paris. - 1989, Retrospective, museum La Piscine in Roubaix, from April 29th to June 11th date extended to June 25th. - Jean-Marc Campagne, Alfred Courmes, Prospecteur de mirages entre ciel et chair, photographs by Robert Doisneau, Jacqueline Hyde, Marc Vaux. Eric Losfeld editor, 1973, pages 73 and 114. - Vitalie Andriveau – Gilles Bernard, Alfred Courmes, foreword by Michel Onfray, Cherche midi editor, 2003, page 93.